Coconut Water Review. HHL Blind Taste-Test. 8/2012 UPDATE! I have to say that lately for some reason I have fallen IN LOVE with Nirvana coconut water - but the trick is to buy the version in the tall glass bottle. Not the can! Crazy since I hated it when I did this blind taste test .. maybe they changed their sourcing? Who knows. Love it now. Just wanted to update since many of you still read this archive post! All in Good Fun. OK, OK, so yes my husband and I took this blind taste test very seriously, but I want to remind you that this review represents just the opinions of two people. 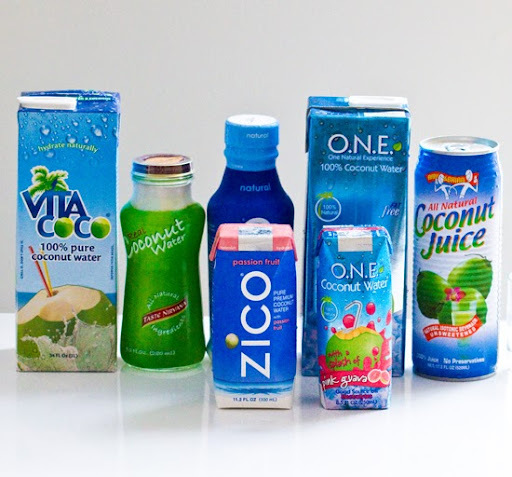 I like to consider myself a coconut water tasting expert - but really, everyone's tastes are different. 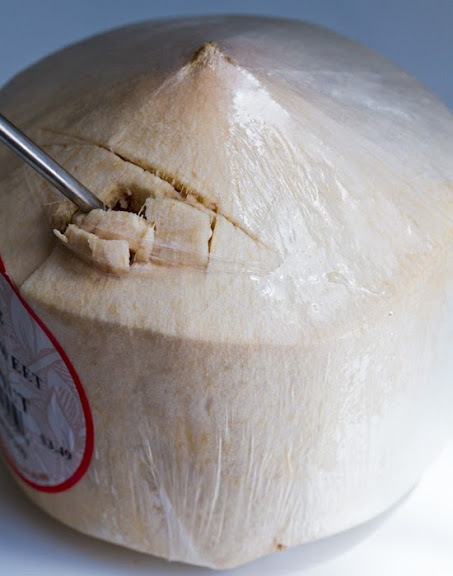 So check out the results, but remember to try your own coconut water tasting session and discover what coconut water is your favorite. The Brands. I selected 8 brands from the store as well as one live whole coconut. You'll see all the top brands in my line-up except for one: Naked. I couldn't find any Naked coconut water so I had to leave it out. Sidenote, I have tried Naked before and liked it. So don't count it out. 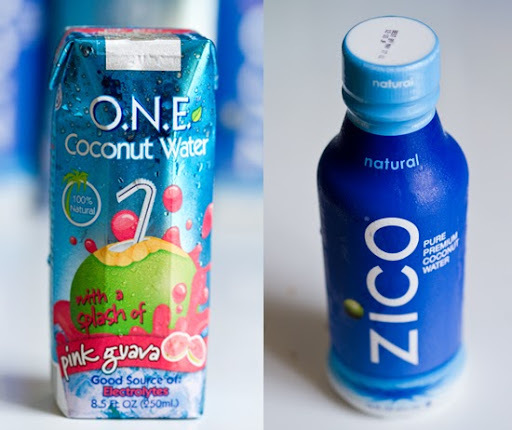 The coconut water brands I did include: ONE, ONE Splash, ZICO plastic bottle, ZICO TetraPak, Amy and Brian, Vita CoCo, Taste Nirvana and Exotic Superfoods. And the whole fresh young coconut I bought at the store and hacked open myself. The Method. For the taste test I made sure each package was fresh and chilled. I set up 9 uniform opaque tasting cups and labeled them on the bottom. I wrote down which brand was in each cup. Then my husband and I rearranged the cups and not knowing which brand was in what cup - we labeled the cups from 1 to 9 and began sipping and noting. Also note we did this first thing in the morning so we were thirsty and our palates were clean. Scoring. I wrote down my tasting notes after tasting each coconut water. My husband shouted out his notes and I interpreted his comments and facial expressions. He approved all notated comments. Once we had tasted all the brands - we went back and re-tasted each cup and lined them up from best to worst - based on taste. This line-up represented the end 1-9 Taste Rankings that you will see below. 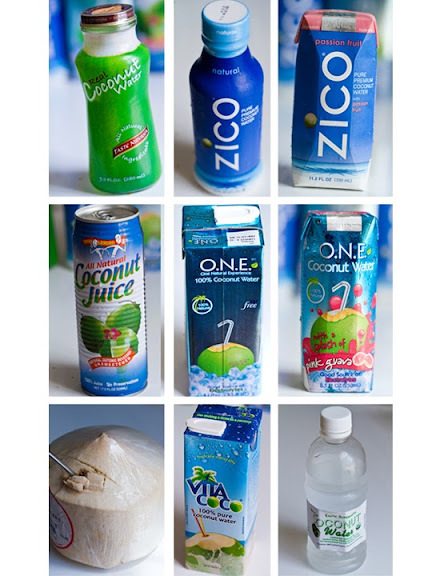 Lastly, aside from the taste rankings, I felt it was important to discuss other factors you should consider when buying coconut water. Factors like price, availabilty and ease of use. What Surprised Me. 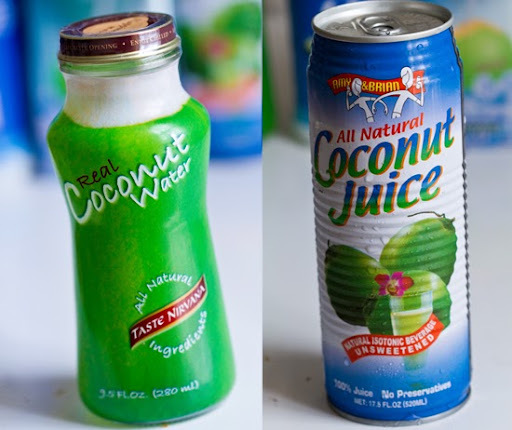 I was shocked by how different the coconut water tasted when I had no idea what brand it was! I thought I would be able to easily distinguish the brands - not so! In most cases I had no idea what brand I was reviewing and sipping as the tasting progressed. But I did know what I liked and what I didn't like..
K: Lemony, bright, slightly flat aftertaste. G: bland. Starts sweet, ends sour. K: Love the obvious essence flavor. Light, refreshing, clean. G: Not liking the flavor. I like it pure. Clean though. K: Oddly milky. Hits the back of my throat. Round, but flat. K: Way too sweet/bold. Aftertaste like coconut shreds I'd find in a coconut dessert. G: Strong coconut aftertaste. Too sweet-tastingfor me. Complex. K: Round, soft flavor. Pleasing. Very drinkable. G: Not distinguishable. Actually, I like it a lot. K: Zesty clean, bright flavor. Pure and drinkable. Refreshing! G: Nice and clean. Like it a lot. K: Obviously sweet. I like the flavor though. Tropical-tasting. G: Way too sweet for me - not into the flavors. K: OMG. So good. Creamy, round, clean, fresh tasting. Could chug gallons of this. Smooth finish. G: Natural taste. Pure. Oh, it's the best. No phony smell. K: Super smooth and round flavor. Pure and subtle with a super bright finish. G: Really like. This is good. Tastes pure. The Lesson. Overall the HHL Coconut Water Review was a fun experience and a good wake up call in confirming that not all coconut water brands are created equal. 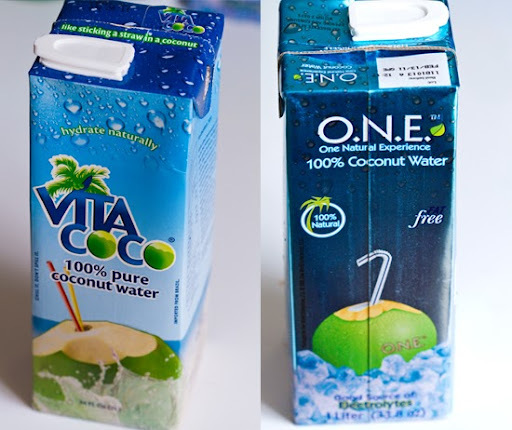 1) Price - One small container on coconut water can cost anywhere from $1 - $3+ (depending on where and how you buy it). The key is to buy in bulk when you spot a sale on your favorite brand. I'll admit that the two highest ranking coconut water options are also the most expensive. So if you are looking for a budget price - you may have to compromise taste a tiny bit. 2) Availability. Just as the top two brands are costly - they are also hard to find. 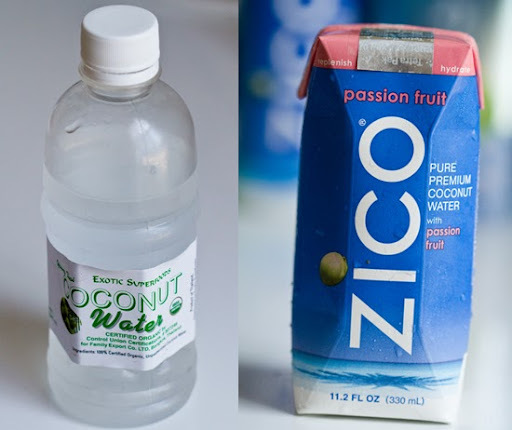 You probably want to buy coconut water on your routine shopping trip - and your store may only have one or two brands. 3) Ease of Use. Opening a fresh young coconut is a pain! It can ruin your knife and drive you a little nuts. Plus, a real coconut is heavy and tricky to store. Tetra Paks and even the re-seal able varieties are obviously the easiest varieties to use/drink. ...try a wide variety of options and soon you'll discover what you like best. In Closing. The winner: the coconut water that came straight from the coconut. Was it really a fair fight? However, I know a few people who don't like the intense flavor or straight-from-the-coconut water. So preferences do vary. I was happy with the results - it appears I am buying the brands that I enjoy the most - marketing and packaging aside. It's amazing how a blind-taste distorts all your preexisting perceptions about what you are drinking. For budget and taste conscious shoppers, I think finding ONE at Trader Joe's for only $3 a liter is your best bet. ...what would your taste test uncover??? Weigh in on this in the comments!